Wood Art is amazing and very creative. Sometimes when you see it, you wonder how such a masterpiece can be designed out of just a piece of wood. It takes a lot of talent and patience to create something so incredible. 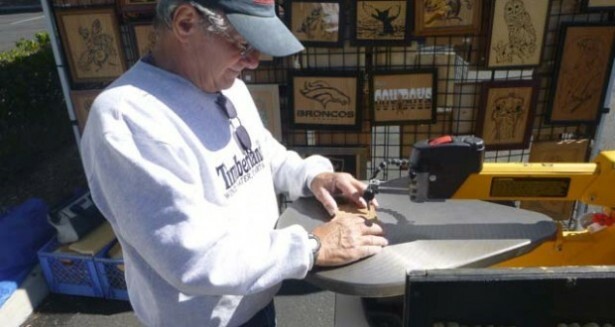 Here in Santa Clarita, we have our very own wood artist named Jim McGuire and the name of his shop is Wood ‘N Tole. His business is located in his garage in Canyon Country, California. He specializes in all sorts of wood art from portraits to nature scenes and even jewelry; that takes raw talent. His most well-known designs that he has carved out of wood are “Big Cats” and “First Fathers”. The types of wood used are natural wood, eucalyptus, plywood or any type of wood you bring him. He can create a masterpiece for just you and your family to enjoy. He is so incredible that his wood art has been awarded and been show off throughout many art exhibits in and around the Santa Clarita area. His wife Arlene, who supports him through everything, helps him take his handcrafted creations to craft fairs. These craft shows take place all over Southern California. Not only his work is unbelievable, he has won several awards for his wood art.With his imagination, there are infinite possibilities on what Wood ‘N Tole can create. If you want a unique piece of art that no one has, go check out Jim McGuire’s Wood ‘N Tole in the Santa Clarita Valley. His art is just truly flawless and amazing, no piece is alike. Jim creates his masterpieces for you and your own vision as well as adding his own unique touch.